If you’ve ever tried to view or edit a template for a WordPress blog, Joomla site, or other dynamic technology in a program like Adobe Dreamweaver, you probably didn’t get what you were hoping for — unless you set up your computer as a Web server. One of the biggest challenges when it comes to creating blogs and other dynamic web sites is that you can’t just preview dynamic Web pages the way you can preview static pages with a Web browser on your hard drive. When your creating a blog, you need more than Firefox to preview these pages on your own computer. Blogs, and other dynamic sites are designed to only work on Web servers. If you’re using them online, you’re fine, but if you want to work on your blog or Joomla site on your personal computer before you publish it to your web host, you have to essentially turn your computer into a Web server. That’s not has complicated as you might imagine, but it’s definitely harder than installing a Firefox, or even Dreamweaver. To serve your blog or Joomla page to a browser, you need server software, and you may also need a database , application software, and other programs (such as WordPress or Joomla). Web server: This term commonly refers to two things: (a) a piece of computer hardware on which a Web site is stored (usually a high-powered computer) and (b) the software on that computer that enables it to work as a server. A Web server responds to requests from a Web browser by serving up Web pages based on those requests. Tip: If you can run Dreamweaver CS5, you’re a step ahead: Your personal computer should be more than powerful enough to act as a Web server. The main reason most of us don’t use our own computers as Web servers is that we lack the high-end Internet connection you find at most commercial service providers. Data source: The best dynamic sites are created by connecting a database to a Web site. Thus, in addition to a Web server, you need to install a database program, such as MySQL and then use it to set up a database on your local computer. Application server: You may also need to set up an application server, which helps the Web server process specially marked Web pages. When the browser requests one of these pages, the Web server hands off the page to the application server, which processes the page before sending it to the browser. Fortunately, you’re not the only one who has ever had to set up a computer to serve dynamic Web pages; some smart programmers have put together packages with all the software you need to mimic the functions of the kind of Web server that will host your site when it’s published online. You’ll find step-by-set instructions for how to set up a local server using the software listed below in this tutorial. What’s the best server software package? Many different server programs are in use on the Web today, including the ever-popular Apache. Big commercial service providers use sophisticated server programs to host Web sites for many clients at a time– but there are simpler options that work well on desktop computers. Remember: Until you set up a local Web server and set the proper permissions on your local computer, you won’t be able to create and test a dynamic site, regardless of whether you write the programming code yourself or use a CMS, such as WordPress or Joomla!. MAMP stands for Macintosh, Apache, MySQL, and PHP. Essentially MAMP collects all the programs you need in one specially designed package. The idea is to simplify the setup of a local Web server and the related software you need for developing and testing a dynamic Web site with Dreamweaver on any computer running Mac OS X. (You can find MAMP atwww.mamp.info). 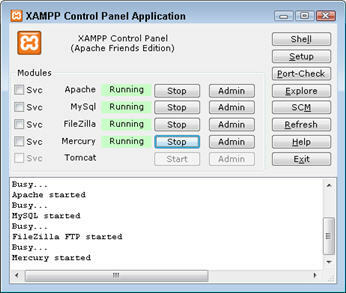 You’ll find step-by-set instructions for how to set up a local serve using the MAMP or XAMPP software here. Remember: If you’re creating a custom dynamic site, after you set up the server software and related software listed in this section, you’re ready to go. However, if you’re using a blogging tool or other CMS (such as WordPress or Joomla! ), you must also install those programs and set up the blog on your local computer in exactly the way you intend to set it up on your Web server. Downloading and unzipping the WordPress program is easy, but then you need to set up a database for WordPress, and finally open WordPress in a browser, running it off your local server, to install it. Pay special attention to the instructions for how to edit the wp-config file. The WordPress program should come with a file named wp-config-sample.php. Open it in Dreamweaver, NotePad, or any other text editor that won’t mess it up (i.e. don’t edit this file in Microsoft Word). Note thatnothing will work on your local server until you enter some very specific information about your database and local server setup into this config file. You can find instructions for editing the wp-config file by following this link. You’ll find step-by-set instructions for how to set up a local server, MySQL database, and WordPress in this tutorial.